Just got this today! BIG shoutout to @thebiggoalie for this one! This arrived today. 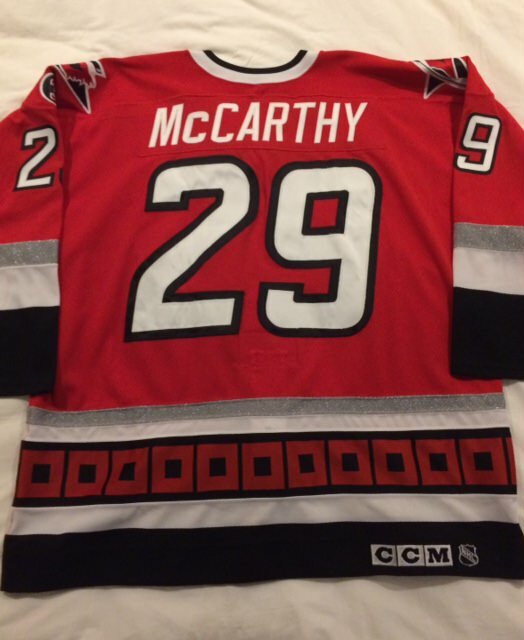 Worn in the 2000-01 preseason by career minor leaguer Jeremiah McCarthy, it has the three patches the Hurricanes wore in 1999-00: NHL2000, Raleigh Arena Inaugural Season, and the Steve Chiasson "3" memorial patch on the shoulder. 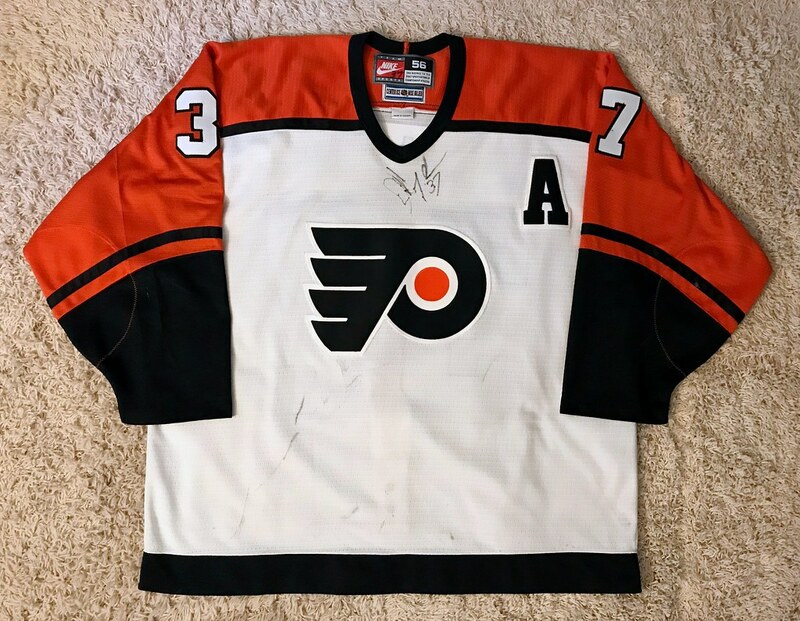 My plan is to strip it and turn it into a Rod Brind'Amour #27, which he wore that season after being acquired from Philly because his usual #17 was already taken. I miss that style. it was unique and had character. They're way too generic now. Not quite my holy grail, but very close! 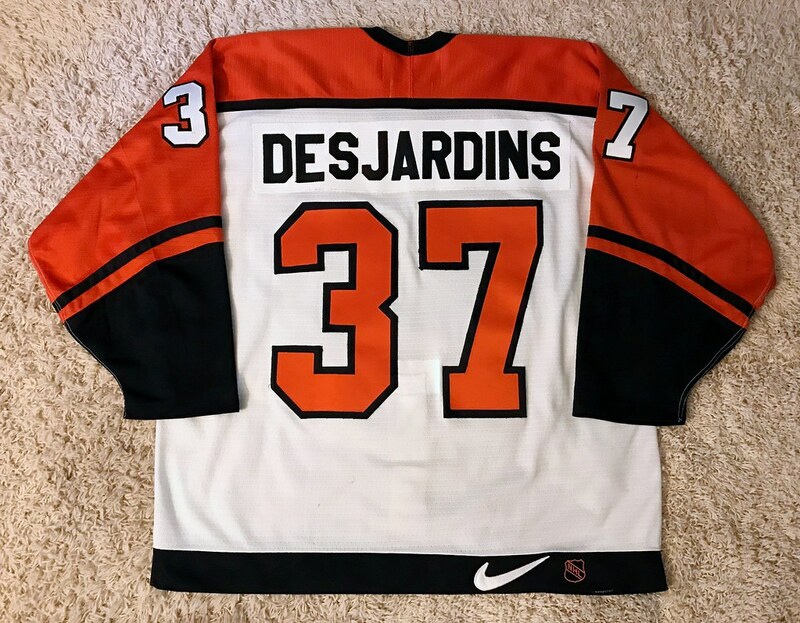 1996-97 Game Worn Eric Desjardins home w/ "A". 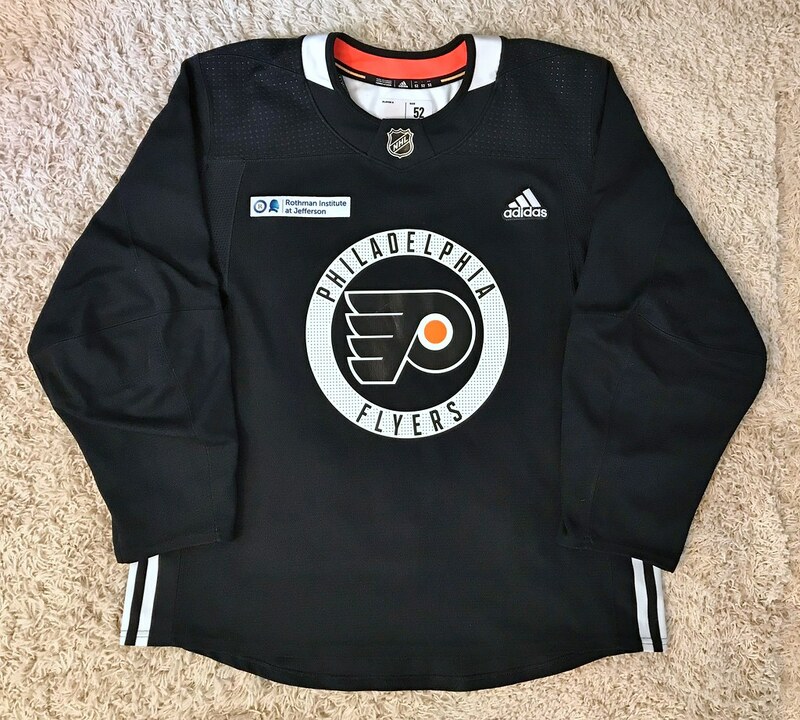 According to the original owner, this was a SOTB jersey. It has some nice marks and burns on it, and it's pretty clear that it was worn in multiple games. Really excited to have this one! 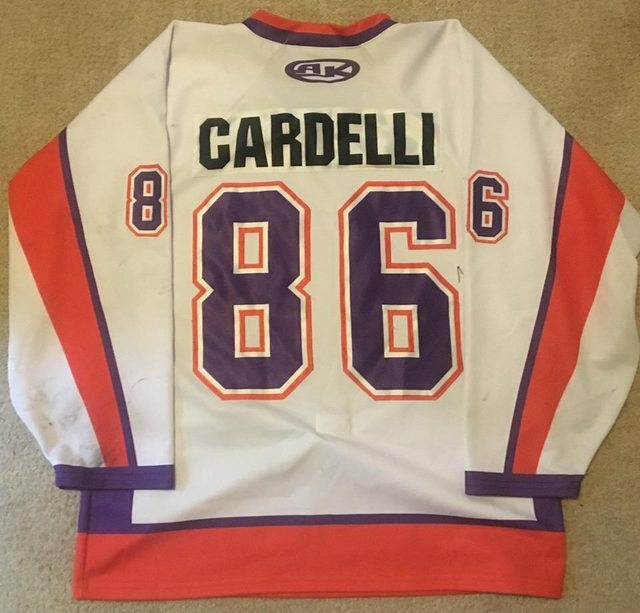 Let's keep the game worn train going. I got my GWA haul today. First, a pair of the some of the sharpest NCAA jerseys you'll ever find. 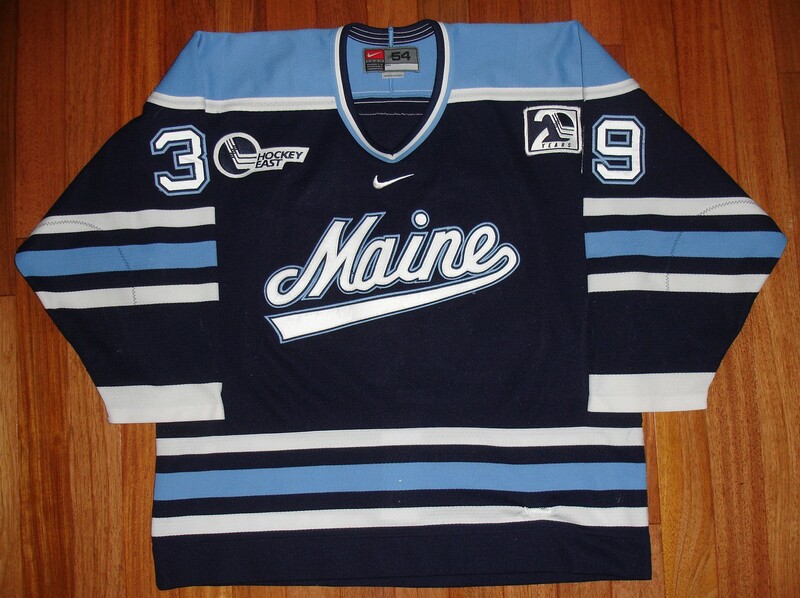 A 2001-02 home and 2002-03 road UMaine Black Bears set. 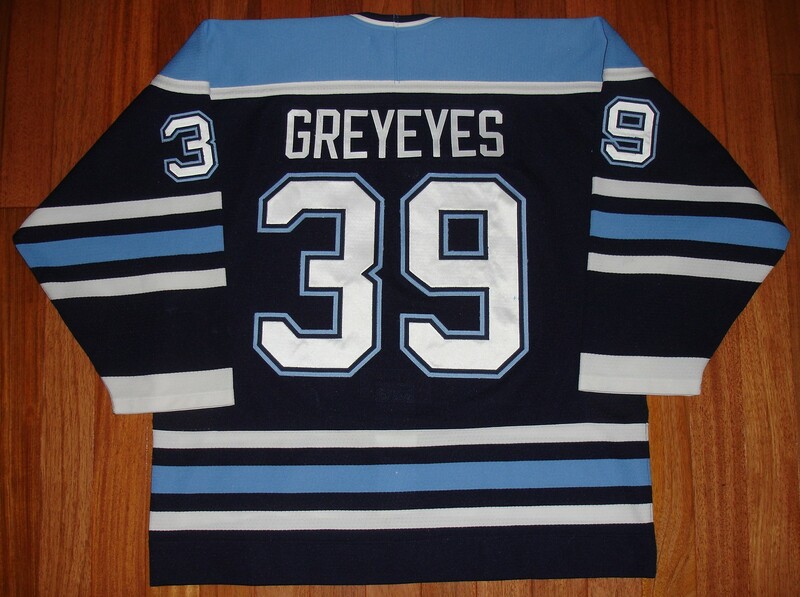 Both have very solid wear with the Greyeyes having a great repair on the front of the stomach. 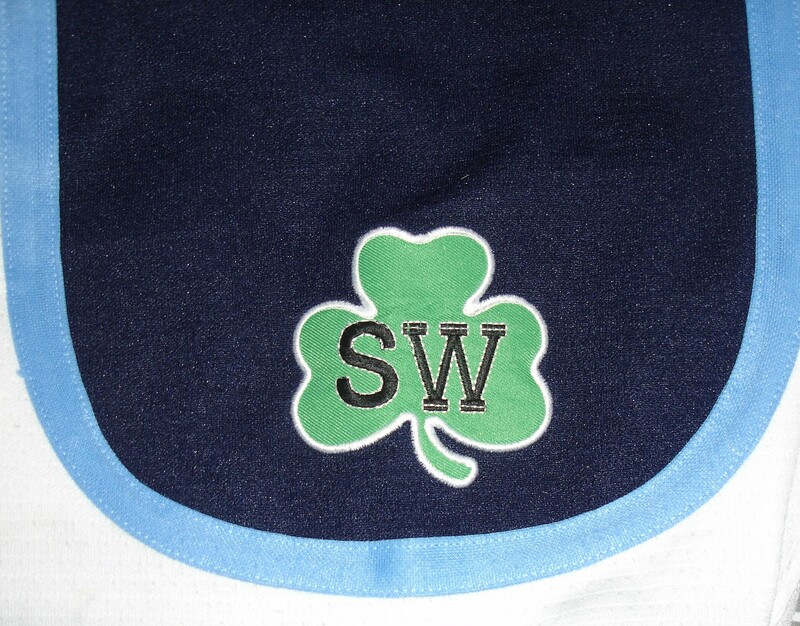 The highlight here though is obviously the beautiful Shawn Walsh shamrock memorial patch on the Cameron Lyall jersey. Shawn, who had brought the Bears to two National Championships in 1993 (42-1-2!) and 1999, died of a rare form of kidney cancer before the season started in 2001. 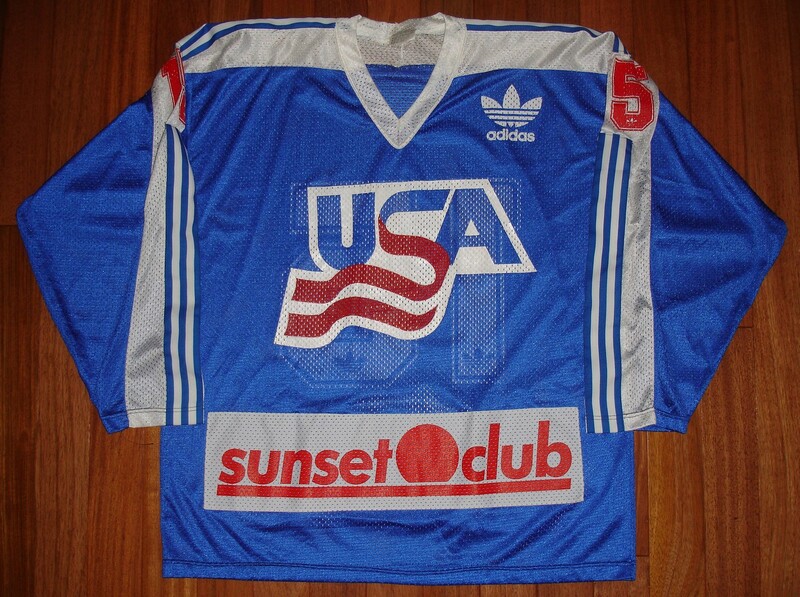 Then, one of those magical finds that show up only once in a very long time........a 1988 Spengler Cup USA Selects jersey! 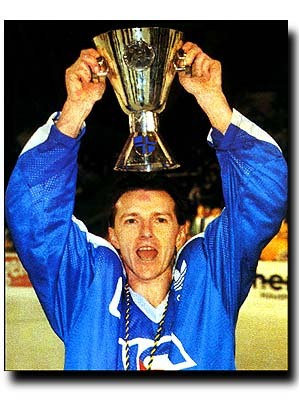 This was the one and only time that an American team had won the Spengler Cup. Ron Wilson....yes, that Ron Wilson...captained the team to the gold medal game where they absolutely thrashed Team Canada 8-1. Ever since I saw this listed, I've been trying to find out who wore #15 in that tournament but it's very difficult to find accurate roster records and I don't even know for sure if the team used nameplates. Interestingly enough, the year later, Team USA wore a very similar jersey to this BUT with one noticeable difference: a Spengler Cup patch was on the right breast. The above picture clearly shows no patch on the chest so surely this was worn with a gold medal hanging around the neck. Cross another of the USA oddities off my list! Very nice. CCM, Koho and Reebok if those styles are hard to find and not often for cheap. Still trying to find a red Reebok to go with my white. Me too. I really hope the Canes change it up for 19-20 since this coming season was too soon for major changes. I liked the direction the home was going and if they keep that style, hope they make the road match. 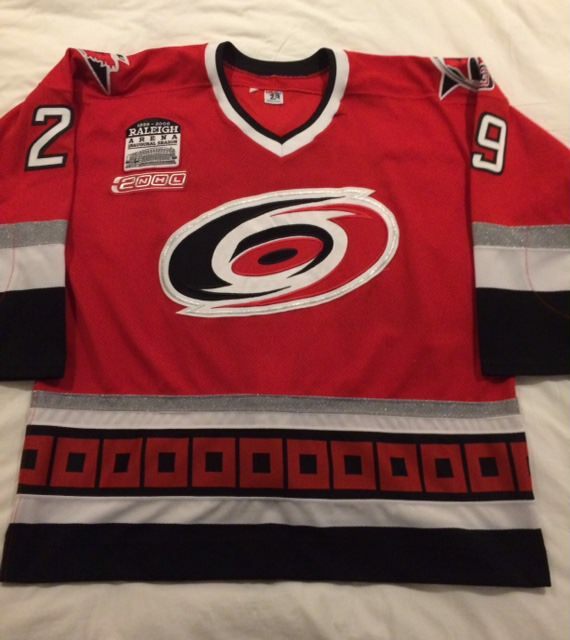 I personally would really like them to add the secondary logo back. 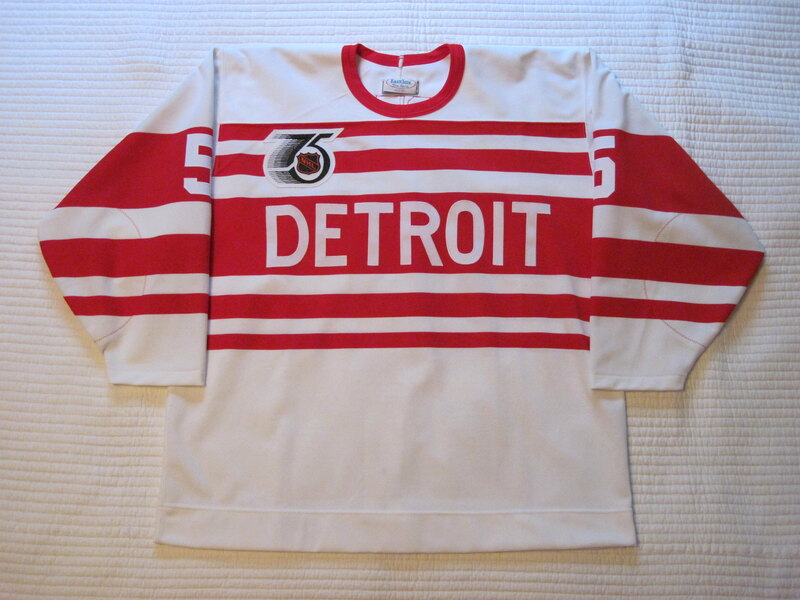 I agree about having the current road jerseys more closely mirror the home ones. 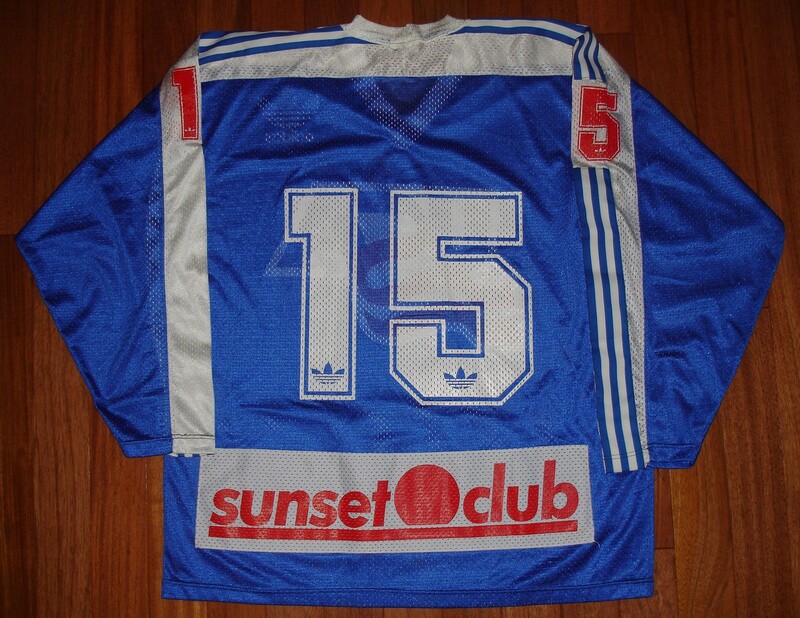 The adidas homes are a big improvement over the last Reebok homes IMO. 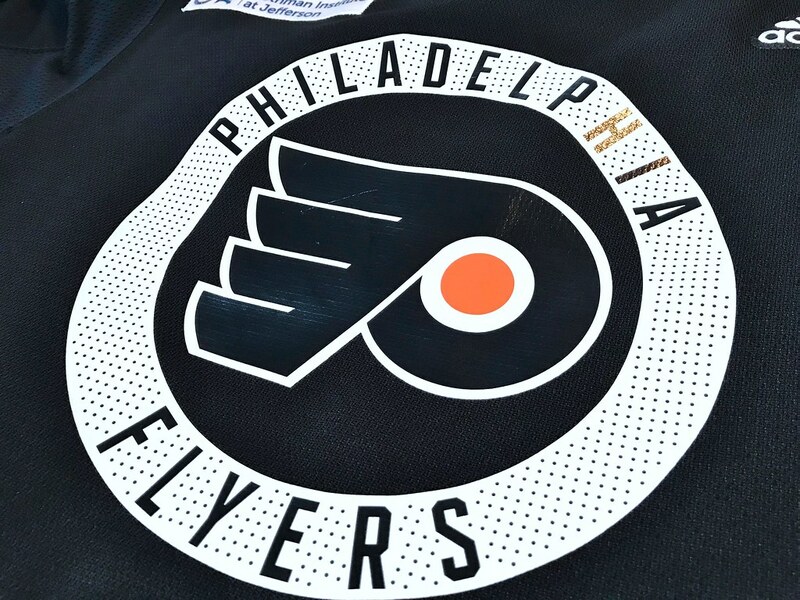 I was hoping that at least the third jersey would come back with the secondary logo, but the rumors I've heard make me think they're going in a different direction. 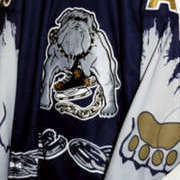 @Brilliant!, those Maine jerseys are awesome. I'm surprised how much I like that color combination. 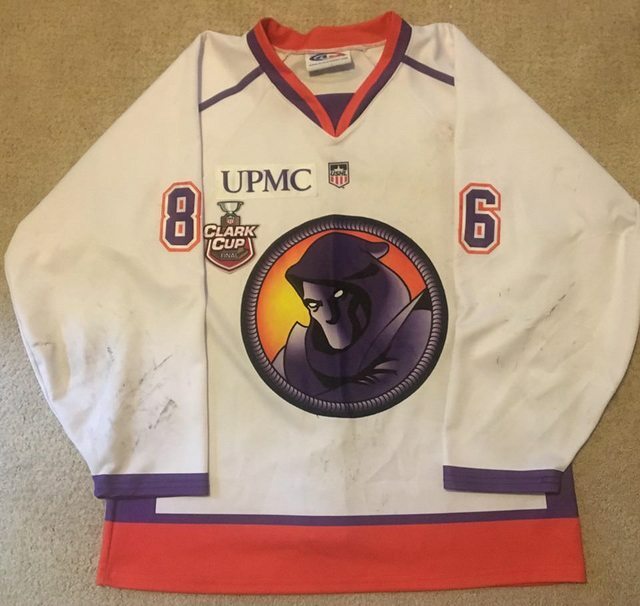 A Youngstown Phantoms (USHL) jersey from this year. 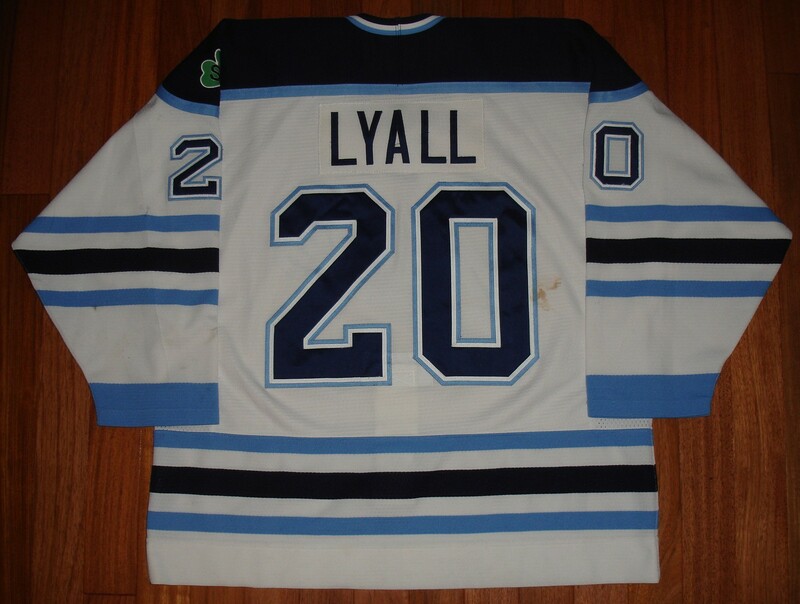 Yeah, yeah I know it's not an NHL jersey as is common 'round these parts but I have photomatched this to both Youngstown road games in the Clark Cup final. The player scored the OT game winner in game 2 wearing this. This was no doubt worn in regular season games given the wear. There's a lot of heatpressing going on here but it's interesting to note that the crest is made of very flimsy material that's stitched. That's the logo and name of the fireworks chain that is owned by the guy who owns that team. The ultimate advertising patch. Thanks they don’t have many left on the site. 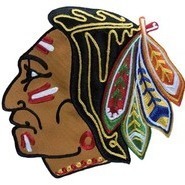 So tempted to pick up some jerseys from them, but can't stomach the thought of wearing the teams they have. Really wish there was some way to remove that rubber crest! Yeah, you're kind of limited to the teams they contract with. Is this considered a pickup? 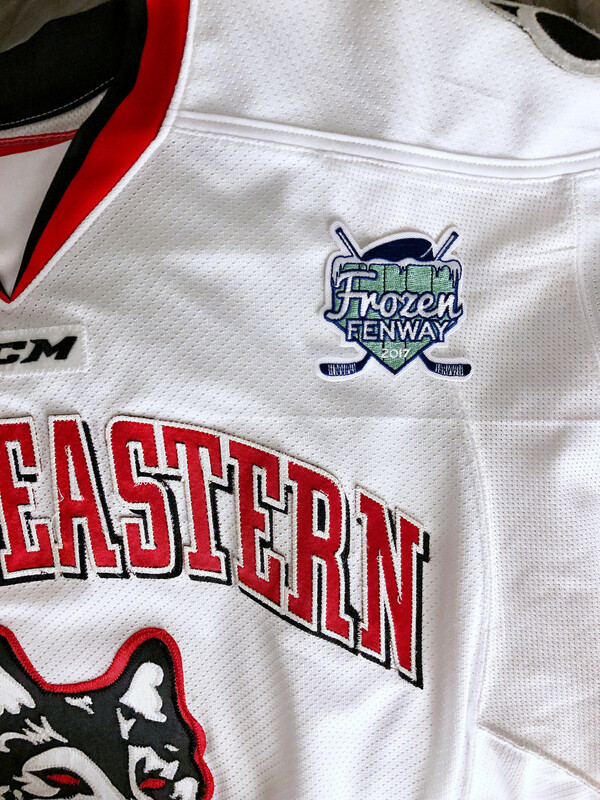 There is no chance loose Frozen Fenway patches come up on the secondhand market so I took matters into my own hands and had a few made for my Davies jersey. I photo matched the jersey and it was clearly used throughout the season including the FF game which left glue outlines from the patch. Going to have this stitched on, but for the time being I'm stoked on how they turned out!! Whoever did those patches for you they did a great job! 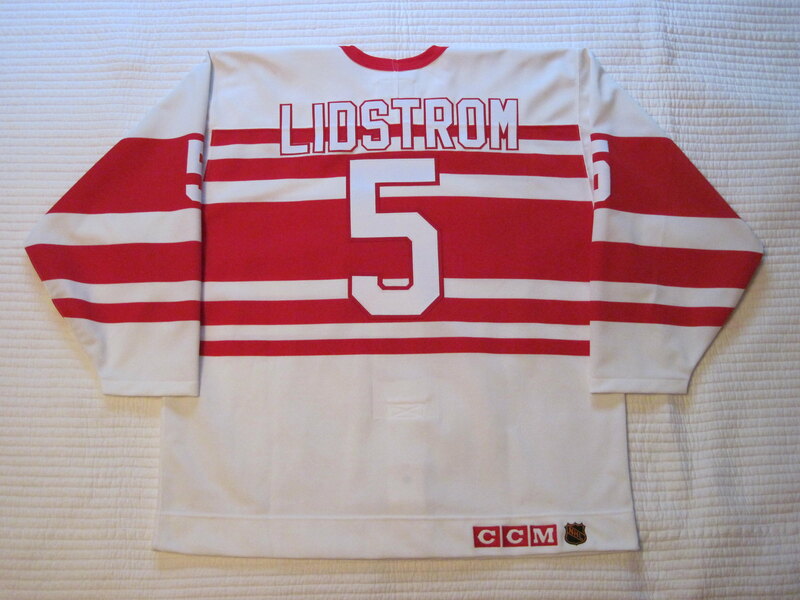 91-92 Lidstrom, wanted this jersey ever since I laid eyes on it in the jersey book! 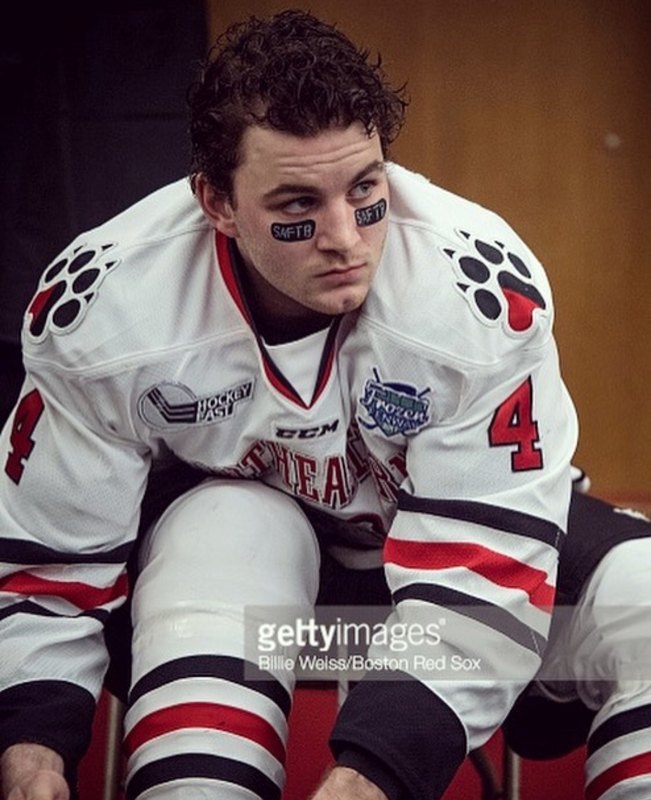 Keeners was showcasing a similar one on instagram the other day. It’s the same jersey! ? Yes, thanks, same one. After watching the videos it got me even more excited to get it back. Keener did some great work, yet again. I thought it was too at first. But yours has a blue whale tail and his looks green? Or is it just lighting differences? It's definitely the same jersey. It does look green in that instagram pic... for sure the lighting. 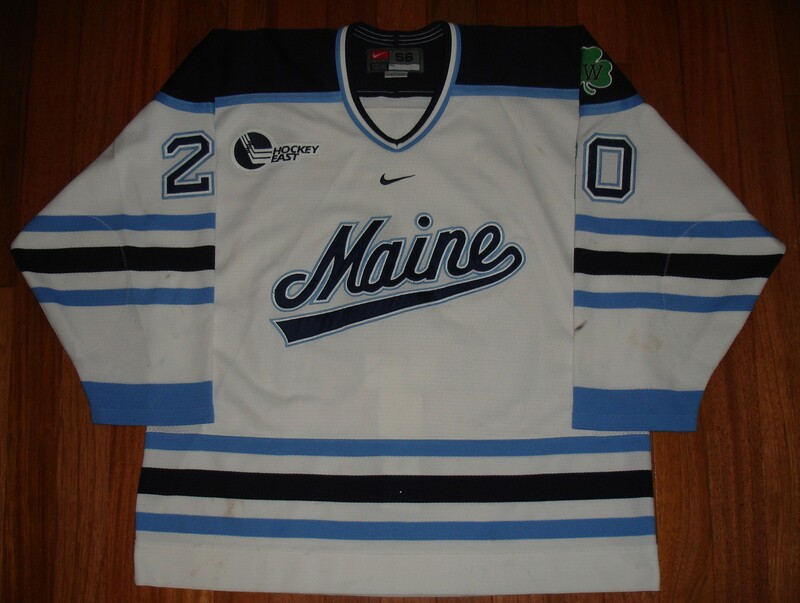 Best part was no worries finding matching mesh since they didn't use nameplates on the Whalers. They all look really great!